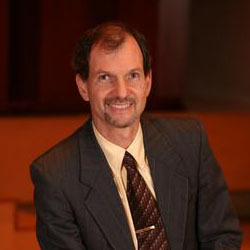 Brian Marks is Associate Professor of Piano and Director of Keyboard Studies at Baylor University. His performances as a concerto soloist have covered repertoire from the Pre-Classic era on fortepiano to late 20th-century works. As a soloist and collaborative artist, he has premiered a number of new works, including Libby Larsen’s Barn Dances for flute, clarinet, and piano, and Normand Lockwood’s 8 Details and Summary for solo piano. His recording of Pulitzer Prize-winning composer John Harbison's San Antonio for saxophone and piano with Baylor University saxophonist Michael Jacobson can be heard on the AUR label. Recent professional highlights include performances and masterclasses in Japan and Poland. Dr. Marks is a frequent presenter at conferences and professional meetings. His appearances include the national meetings of the Music Teachers National Association, the College Music Society, and the Society for American Music, as well as numerous workshops and presentations at regional meetings of professional organization and for local music teacher associations. Dr. Marks holds the Doctor of Musical Arts and Master of Music degrees from The University of Texas at Austin, the Bachelor of Music degree from the University of Denver, and has additional studies in musicology at the Ludwig Maximilians University in Munich, Germany. His teachers include Nancy Garrett, Danielle Martin, Edith Oppens, David Genova and Theodor Lichtmann.